Combine all ingredients in a self-sealing plastic bag; seal bag and place in refrigerator 4-24 hours. Remove steaks from marinade, discarding marinade. Grill over medium-hot coals, 7 minutes per side, turning once. You'll love the simple marinade for these pork steaks. In fact, you probably have the ingredients on hand. 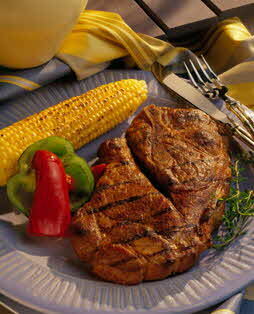 You can substitute any type of pork chop for the blade steaks in this recipe to suit whatever you have on hand. Serve with grilled corn on the cob and fresh fruit kabobs.